We have a good news for you: The Wing Armchair is now available in Dark Brown! The Wing Armchair is made from an organically shaped seat with comfortable back and armrests. It comes in brown, light grey, charcoal grey and red. Note that the colours are not pale boring single colour but there are some black lines crossing the fabric blend, creating a more vibrating and astonishing look of the Wing Armchair. In the feast of furnishings, a wing chair is a design representative—and one that is always popular, like the mac and cheese of upholstered seating. The Wing Armchair is reliably comforting and comfortable especially when it is upholstered that it feels really good to relax into as if someone is hugging you. The classic piece of the Wing Armchair boasts a generous size and stately shape that can easily act as the main attraction in living rooms, study rooms and receptions. Most of our clients like to match the Wing Armchair with Evan Solid Oak Wood Desk, Hullett Solid Oak Desk and Minkoff Solid Oak Wood Desk with Drawer in their study rooms. As upholstery furnitures are all-purpose that it can match with most kinds of materials like woods, glasses and different other fabrics. The Polyester blend fabric material of the Wing Armchair provides you extraordinary comfort, and therefore it is ideal to sit on it for a whole day to work or study. Of course it is also welcome to do it as a lounge chair, putting in receptions, waiting areas and living rooms. Try to put a coffee table next to it, for example, Jacobsen Coffee Table which you can put a coffee, a book and gadgets on it while you are relaxing on the Wing Armchair. Now visit Decor8 and see all displays in various colours! 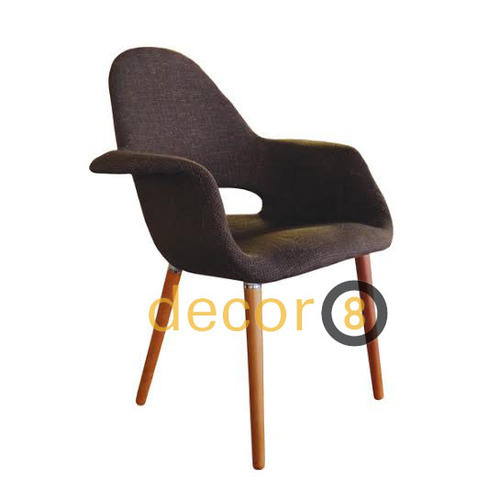 This entry was posted in Dining Chair, Seating, Side Chairs and tagged armchairs hong kong, dining chairs hong kong, lounge chairs hong kong, modern, modern chairs, modern design, organic, wing armchairs.